VANCOUVER – Sabina Gold & Silver Corp. (“Sabina”) or (the “Company”) (SBB – TSX) is pleased to announce additional results from the summer exploration diamond drilling program at its 100% owned Back River Gold Project in Nunavut, Canada. A summer exploration drill program of 9,868 metres in 17 drill holes has now been completed. Drilling successfully tested high impact exploration targets in and around existing resources at the Goose Property, including five holes in the high-grade Umwelt Vault zone. Two of these drill holes; 17GSE522B and 17GSE517, tested the central area of the Vault zone and one drill hole, 17GSE520 tested an eastern fold hinge of the zone and are reported in this release. See Figure 1.0 for drill hole locations and Table 1.0 for significant intervals. 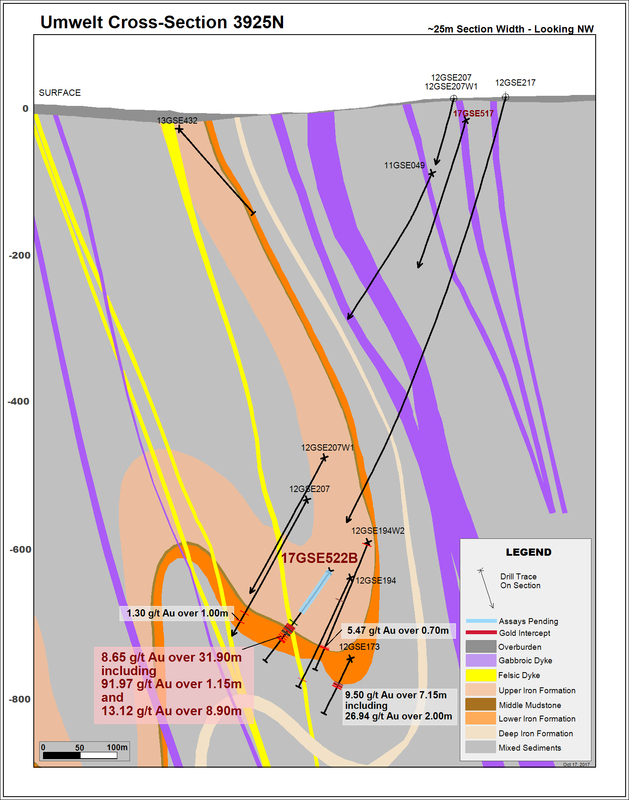 Drilling of 17GSE522B which returned 8.65 g/t Au over 31.90 m including 91.97 g/t Au over 1.15 m and 13.12 g/t Au over 8.90 m has successfully expanded the down plunge length of the high grade targeted zone to greater than 45 meters south of the 2012 drill hole 12GSE217 (see cross section in Figure 2). 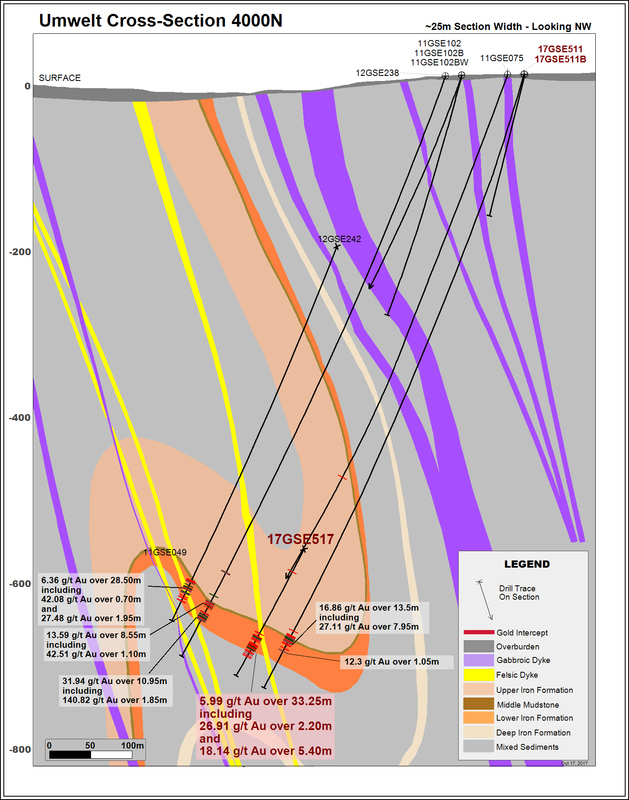 Drill hole 17GSE517 confirmed mineralization continuity central to the Vault Zone, positioned approximately 75 m up plunge from 17GSE522B, intersected favourable mineralization returning an intercept of 5.99 g/t Au over 33.25 m including 26.91 g/t Au over 2.20 m and 18.14 g/t Au over 5.40 m (see cross section in Figure 3). *True widths of the intervals are estimated at 80-90% of the core length. Both intercepts are defined by strong alteration and mineralization systems within a favourable Back River geological setting that is conventional to resources hosted elsewhere on the project. Alteration consists of strong silicification and amphibole and chlorite development within oxide iron formation. Mineralization consists of arsenopyrite, pyrrhotite and localized visible gold within the highly altered and veined zones. The remaining two Vault drill holes completed this summer will be reported as assays are received. 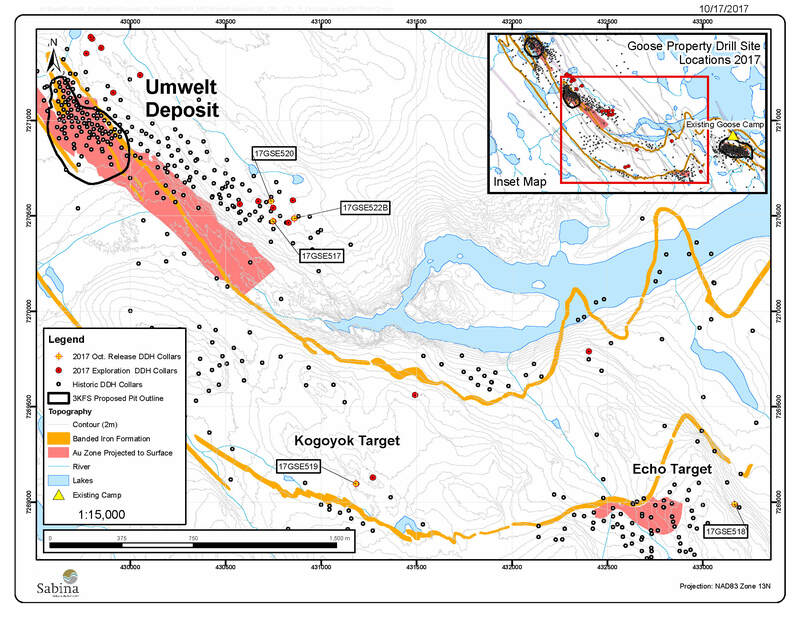 Additional assays are also received from drill holes now completed at the Kogoyok and Echo targets which occur along the southern trend of iron formation located approximately 3 kilometers southeast of the Umwelt Deposit. Results within this greater than 2 kilometer developing gold setting enhance exploration vectoring and understanding of the property wide geologic framework. These target areas remain largely underexplored with drilling focused on defining favourable settings consisting of altered iron formation, felsic intrusive units, and structural elements associated with Back River style mineralization. Sabina continues to pursue new discoveries within de-risked and large scale geologic trends in which the company has a district expertise and diverse and integrated data set. **True widths of the intervals are unknown at this time. Further assay results from the drilling program will continue to be released as they become available. The Qualified Person as defined by NI 43-101 as pertains to the Back River Project, is James Maxwell P.Geo, Exploration Manager, for the Company. All drill core samples selected within the exploration program are subject to a company standard of internal quality control and quality assurance programs which include the insertion of certified reference materials, blank materials and duplicates analysis. All samples are sent to SGS Canada Inc. located in Burnaby, British Columbia where they are processed for gold analysis by 50 gram fire assay with finish by a combination of atomic absorption and gravimetric methods. Additionally, analysis by screen metallic processes is performed on select samples. Sabina Gold & Silver Corp. is a well-financed, emerging precious metals company with district scale, advanced, high grade gold assets in one of the world’s newest, politically stable mining jurisdictions: Nunavut, Canada. Sabina released a Feasibility Study on its 100% owned Back River Gold Project which presents a project that has been designed on a fit-for purpose basis, with the potential to produce ~200,000 ounces a year for ~11 years with a rapid payback of 2.9 years (see “Technical Report for the Initial Project Feasibility Study on the Back River Gold Property, Nunavut, Canada” dated October 28, 2015). At a US$1,150 gold price and a 0.80 (US$:C$) exchange rate, the Study delivers a potential after tax internal rate of return of approximately 24.2% with an initial CAPEX of $415 million. In addition to Back River, Sabina also owns a significant silver royalty on Glencore’s Hackett River Project. The silver royalty on Hackett River’s silver production is comprised of 22.5% of the first 190 million ounces produced and 12.5% of all silver produced thereafter. The Company had approximately C$36.6 million in cash and equivalents on June 30, 2017, not including the $6 million flow-through financing completed in September 2017. This news release contains “forward-looking information” within the meaning of applicable securities laws (the “forward-looking statements”), including our belief as to the extent, results and timing of exploration programs including exploration results and resource and reserves estimates. These forward-looking statements are made as of the date of this news release. Readers are cautioned not to place undue reliance on forward-looking statements, as there can be no assurance that the future circumstances, outcomes or results anticipated in or implied by such forward-looking statements will occur or that plans, intentions or expectations upon which the forward-looking statements are based will occur. While we have based these forward-looking statements on our expectations about future events as at the date that such statements were prepared, the statements are not a guarantee that such future events will occur and are subject to risks, uncertainties, assumptions and other factors which could cause events or outcomes to differ materially from those expressed or implied by such forward-looking statements. Such factors and assumptions include, among others, the effects of general economic conditions, commodity prices, changing foreign exchange rates and actions by government and regulatory authorities and misjudgments in the course of preparing forward-looking statements. In addition, there are known and unknown risk factors which could cause our actual results, performance or achievements to differ materially from any future results, performance or achievements expressed or implied by the forward-looking statements. Known risk factors include risks associated with exploration and project development; the need for additional financing; the calculation of mineral resources and reserves; operational risks associated with mining and mineral processing; fluctuations in metal prices; title matters; government regulation; obtaining and renewing necessary licences and permits; environmental liability and insurance; reliance on key personnel; the potential for conflicts of interest among certain of our officers or directors; the absence of dividends; currency fluctuations; labour disputes; competition; dilution; the volatility of our common share price and volume; future sales of shares by existing shareholders; and other risks and uncertainties, including those relating to the Back River Project and general risks associated with the mineral exploration and development industry described in our Annual Information Form, financial statements and MD&A for the fiscal period ended December 31, 2016 filed with the Canadian Securities Administrators and available at www.sedar.com. Although we have attempted to identify important factors that could cause actual actions, events or results to differ materially from those described in forward-looking statements, there may be other factors that cause actions, events or results not to be as anticipated, estimated or intended. There can be no assurance that forward-looking statements will prove to be accurate, as actual results and future events could differ materially from those anticipated in such statements. Accordingly, readers should not place undue reliance on forward-looking statements. We are under no obligation to update or alter any forward-looking statements except as required under applicable securities laws. This news release has been authorized by the undersigned on behalf of Sabina Gold & Silver Corp. Figure 2 – Umwelt Cross-Section 3925N Highlighting 17GSE522B. Figure 3 - Umwelt Cross-Section 4000N Highlighting 17GSE517.